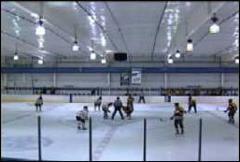 The Chicago Blues Hockey Club's home rink and practice facility is the Edge Ice Arena in Bensenville, Illinois. The Edge is one of Chicagoland's premier facilities with three ice skating surfaces. The Edge is also home to the USHL Junior A Chicago Steel and the Robert Morris Eagles college club hockey program. Edge II and Jefferson Gymnastics Parking on the Right-hand side. Additional Parking at the Municipal facility West of building. Do not pass County Line Rd. Do not pass County Line.